I don’t think anyone would ever call me a rebel. When I hear people talk about all the stupid stuff they did, writing it off as, “Well, I was just a teenager,” I wonder why I never did those same things. The whole balking against my upbringing thing never happened. But when someone says, “pop culture,” I absolutely cringe. When Titantic was really big in high school (I had friends who had time and money to waste and saw it in the theatre more than ten times), I refused to see it. To this day, it remains one of those movies on my personal “banned” list. It could be a masterpiece, but it seemed popular for all the wrong reasons. But fashion is just a small part and not really the important part of how pop culture snakes its way into our lives. This popularity business is starting to make us kind of dumb, quite frankly. Now, I know I’m about to sound old and preachy, but this issue is close to my heart. About twenty years ago, I fell in love with my school’s media center and checked out every book I could, from Ramona to Greek mythology to Little Women. Some of my best memories from that time center around those books or time in the library. Of the six guys I used to hang out with, the bigger the book you read, the cooler you were. And no, they weren’t nerds with pocket protectors (although all of them made the honor roll). They played baseball and football, took piano and violin lessons, sang in our choir, took Tae Kwon Do, drew amazing cartoon-like illustrations in the margins of their homework, had rock collections and pet reptiles. In other words, they were well-rounded guys, not pigeon-holed into one particular sport or other area of interest. And though I fit in well enough with them, I didn’t feel nearly as cool. I was not athletically-oriented at all, and although I started taking piano lessons younger than just about anyone else I knew, I was no good. So what could I do? Read. And the two-to-three hundred page books I routinely read just didn’t cut it anymore. That’s when I found Little Women, a five hundred-pager. To this day, the longer the book, the happier I am to read it. Series? Even better. Today, my son goes to the same school, and I volunteer in the media center. There is now a computer program that assigns reading levels to books, and when kids read them, they receive a certain number of points, according to whichever level it is. One day, my job was to look up each book and find out the level and how many points each book was worth. The books were all new to me, either too advanced for my five-year-old to read yet or too young for me to read for my own pleasure. I asked the media specialist how high the reading levels went, and she said about the eighth grade. The next thing I asked: Did they still have Little Women? Yes, but kids don’t read it all that often (and it’s one of those eighth graders). I waxed eloquent about the books I used to read and asked if she’d noticed a decline in literacy. (She started working at the school my last year there, so she’s seen the entire progression.) Her answer saddened but did not surprise me. Kids these days are more interested in graphic novels, which are fine, but instead of just attracting kids who, otherwise, wouldn’t ever touch a book, they’ve lowered the standard for everyone else. And then there’s music. My dad raised me on Styx, Alan Parsons, Blue Oyster Cult, Tchaikovsky, and Saint-Saens. I grew up singing in choirs and participated in a few musicals as a teenager. I still love all of the above, plus Sweeney Todd, Mumford and Sons, System of a Down (yes, I know), Metallica, and current British composer extraordinaire John Rutter. When people talk about Usher and Adele, I’m kind of lost because I don’t listen to any of that kind of thing, unless I catch it in a commercial or movie. And people my age look at me like I’m crazy. Just like I shouldn’t wear flare jeans (they were so ten years ago), I should get with the times, right? My poor kids won’t ever know what’s popular, unless they hear it with someone else. The music we listen to in the car is either from the above mentioned groups and composers, or one of Peter’s faves of late is the sixth movement from Brahms’s A German Requiem. I actually got the bug to write this particular post as I listened to him singing his heart out, going right along with the tenor line, then asking for me to play it again. Now, you can’t tell me that that “dead white guy’s” music didn’t connect with him. 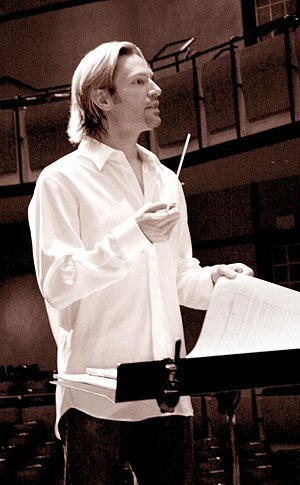 I was moved and encouraged recently when my mom showed me Eric Whitacre on TED Talks. This is a long video, but if you’re familiar with TED, you know it’s worth it. If you need some arm-twisting, Eric is a tech-savvy, good-looking, youngish, self-proclaimed classical composer. And he created a virtual choir in 2011 that comprised over 2000 people from around the world—young, old, black, white, male, female, nerds, cool people—every kind of person imaginable. So that tells me that there’s hope after all, if only we can open enough minds to thinking outside the so-called popularity box. People will learn to connect with music like this if they’re taught that it’s okay, if they think they won’t be teased. And some people like me will love it anyway, not really caring what others think. I’m not trying to create a new kind of popularity, just open people up to more possibilities than what typically top the charts and grace the covers of the magazines at the check-out lines. For parents or teachers who have already given up because their kids just don’t like to read, or who don’t like classical music themselves so never played it for their babies, what kind of message are we sending by this lack of effort? I think it’s unacceptable to give up and say that if we can’t beat them, we might as well join them. Progress isn’t worth it if it plows right over and buries the good along with the out-moded VHS tapes, legwarmers, and suitcase-size mobile phones. Don’t lose the things you love; share them, and watch the wonder and growth at these new-old discoveries.